Dragonrot in Sekiro Shadows Die Twice is a plague that spreads the more you die and resurrect yourself. It has gameplay consequences, like Unseen Aid and other help beginning to dry out the further it spreads. So, people have been wondering how to cure dragon rot in Sekiro. If you’re one of them, then here’s our Sekiro How to Cure Dragonrot to explain how to get rid of the malady, which NPC to talk to and which items you’ll need, etc. How to Cure Dragonrot in Sekiro Shadows Die Twice? 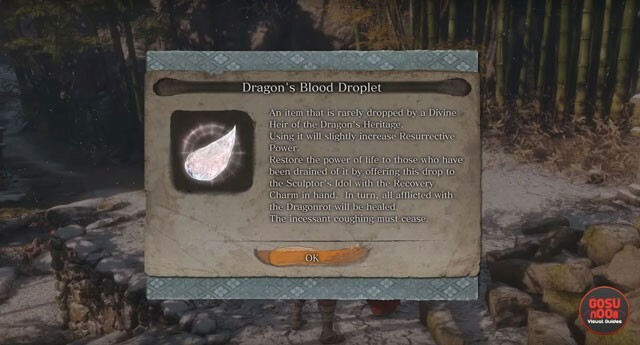 To cure Dragonrot in Sekiro Shadows Die Twice, you’ll have to first obtain the Dragonrot Blood Sample item. With that in hand, head over to the NPC called Emma the Physician. Hand over the Dragonrot Blood Sample to her. In return, you’ll get two items: Recovery Charm and Dragon’s Blood Droplet. The next step is to mosey on over to your nearest Sculptor’s Idol. With the Recovery Charm in hand, give the Dragon’s Blood Droplet as an offering, and voila; everyone’s Dragonrot has been healed. Incidentally, if you want to cure yourself, you might want to pay a visit to the merry old chap called Pot Noble Harunaga. You can find him on a large rock in the water to the right of the Hirata Estate bridge, living in a large pot. In fact, all you’ll see of him is his gross, long-fingered, skeletal hand. From him, you can buy the Divine Grass, which cures all status abnormalities and restores Vitality fully. Mind you, the only currency he accepts are carp scales (for more on those, visit our Sekiro Treasure Carp Scale Locations – Where to Find Pink Carps guide). Also, this is for healing yourself; for Dragonrot, which is a plague that harms others, use the method described above. And so, that’s basically how you can cure Dragonrot in Sekiro: Shadows Die Twice. If you need further assistance, do check out some of our other guides on Sekiro, including Prosthetic Tools Locations and How to Upgrade Prosthetic Tool.